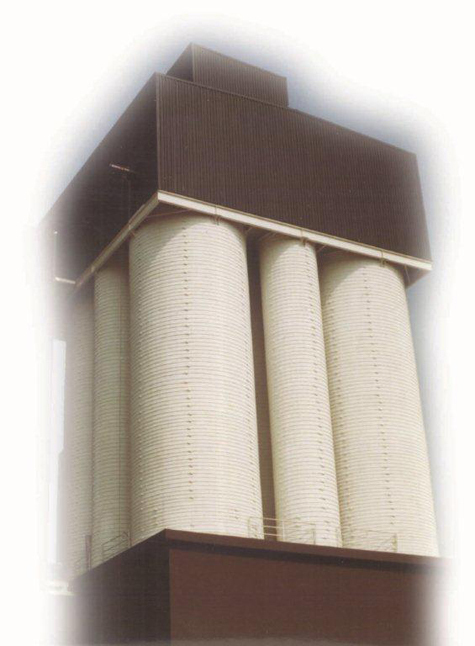 Marietta Silos has remained an industry leader in the construction of stave silos since our development of the technology in 1920. Concrete stave silos are constructed using precast concrete blocks, or staves, that interlock. Staves used for silo construction are typically 10" wide, 30" tall and at least 2" thick. Marietta Silos is the only company in the United States that produces staves at a thickness of 5 ¾" for added durability. Stave silos are reinforced with exterior, galvanized steel hoops which help compress walls and provide the necessary tension for structural integrity. Cementitious coatings used on interior and exterior walls protect stave silos by sealing the internal joints between staves and creating a smooth interior finish. Bonding and waterproofing agents seal the joints between the staves and add a level of corrosion protection to the exterior steel hoops. Concrete stave silos offer versatility and flexibility, as well as economy. They can be designed with many discharge types including cone, flat floor, side discharge, and tunnel discharge.